Our aim is to understand pattern formation in the broadest sense: from a mechanistic perspective -how exactly does the system generate a specific pattern- and from a functional and evolutionary perspective -why does the system generate a pattern in a particular manner, i.e why has this specific pattern forming mechanism evolved. To answer the first question and understand how particular patterning processes operate we develop detailed models of developmental processes in established model organisms. In one line of research we investgate growth, convergent extension and segmentation of the body axis in the flour beetle Tribolium castaneum. Tribolium is a recently established model organism that is particularly interesting from an evolutionary developmental (evo-devo) perspective since it appears to use a segmentation mechanism that strongly resembles vertebrate segmentation. This could point to parallel convergent evolution of complex patterning mechanisms in distinct animal lineages. However, it remains unclear to what extent the patterning mechanisms really are similar, and we are actively investigating this matter. In another line of research we model growth of the main root and formation of lateral roots in the model plant Arabidopsis thaliana. Plant development differs from animal development in a number of important aspects. First, cells are encased in a cell wall, thereby preventing cell migration. As a consequence all growth and patterning in plants has to be organised from stem cell niches. Second, plants can not change their position and therefore need to flexibly adapt to changing environmental conditions. As a consequence, while animal development produces highly stereotypical bodyplans, plant development is highly plastic. In our work on plant development we investigate how stable development can be coordinated with flexible adaptation to produce robust yet adapted root architectures. To understand from a functional and evolutionary perspective why particular pattern forming mechanisms are used we use two parallel approaches. On the one hand we compare pattern forming mechanisms found in plants and animals and try to relate similarities and differences to similarities and differences in biophysical, historical, and life history traits between plants and animals (e.g. presence versus absence of cell wall, limited embryonic growth versus continued growth, stereotypical versus plastic development). On the other hand we simulate the evolution of developmental patterning mechanisms under various conditions, investigating whether evolution repeatedly invents similar patterning processes and which factors contribute to this evolutionary channelling. A nice example of our approach is our recent work on plant development (Mahonen et al., Nature, 2014). We discovered that plants use localised transcription combined with growth dilution and cell-cell movement to generate a gradient of the Plethora transcription factors controlling root growth and developmental zonation. This closely resembles the mechanism generating the vertebrate FGF gradient controlling axial elongation and patterning. A gradient that both controls growth and is controlled by growth has been suggested as a robust means to coordinate and scale patterning with growth, and the fact that these mechanisms evolved in parallel across kingdom strongly supports this idea. 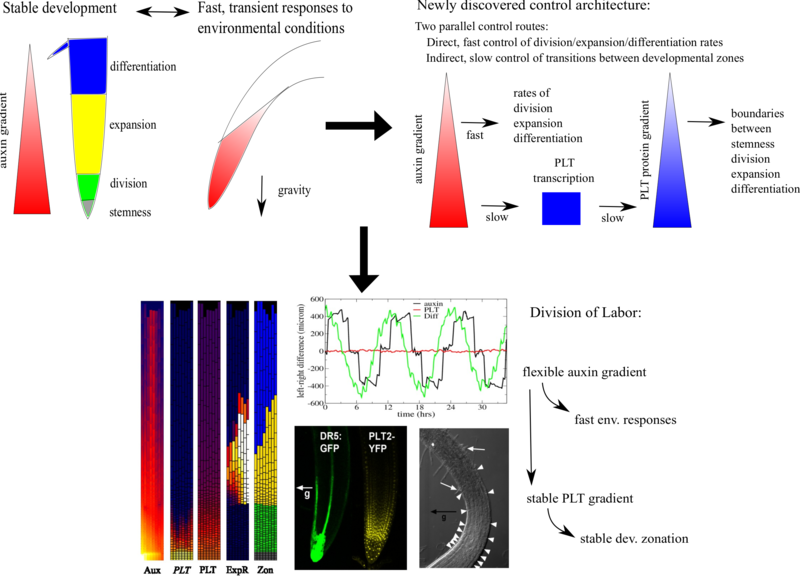 Furthermore, we discovered that while the PLT gradient instructs were cells divide, elongate and differentiate, the auxin gradient determines the rates of cell division, elongation and differentiation and that this partial division of labour is essential for combining stable developmental zonation with flexible adjustment to environmental conditions. In other words, the used mechanism is a logical evolutionary outcome considering the constraints imposed by the need for stable development and flexible adaptation in plants. The Computational Developmental and Evolutionary Biology Group is part of Theoreotical Biology and Bioinformatics. Plants generate sugars in their leaves (sources) during photosynthesis, which subsequently need to be distributed amongst growing organs such as new, young leaves, flowers, stems and roots as well as storage organs such as potato tubers or fruits (sinks). This sucrose transport depends on the activity of sources and sinks that together determine the osmotic gradients driving vasculature sap transport, with different sources competing for the sucrose. In addition, transport is regulated via long distance signalling molecules that control the activity of cellular sucrose transporters, thereby impacting the relative balance between symplastic (direct cell-to-cell) and apoplastic (cell-to-wall-to-cell) transport routes. Over the course of their development, plants may profoundly change their sugar transport, for example when making storage organs such as tubers they redirect a large part of their sugar transport to these organs. Additionally, depending on environmental conditions, plants may make different decisions on where to invest their sugars, e.g. in flowers for sexual reproduction or rather tubers for asexual reproduction. Exactly how plants reach these decisions, and subsequently rewire their sugar transport remains incompletely understood. Goal of the current project is to develop detailed computational simulation models of plant sucrose transport, incorporating different involved cell types and tissues, cellular uptake and export transporters and their regulation by signalling factors, symplastic and apoplastic transport routes, and source and sink strength dependent vasculature fluxes. The aim is to obtain an understanding of how plants control the amount of sucrose going to tubers versus other plant organs, for example in the context of investiging energy in vegetative reproduction via tubers versus sexual reproduction via flowering. The selected candidate will work in the group of Prof. Kirsten ten Tusscher at the Computational Developmental Biology group at Utrecht University. The PhD position is part of a larger TTW project on potato yield and will be performed in collaboration with the group of Christian Bachem at Wageningen University. Experimental and bioinformatic data obtained in the experimental counterpart of the project will thus serve as input for the modeling, while modeling outcomes will be used to direct future experiments into promising directions. The project is aimed to start January 2019. We are looking for motivated candidates with a background in computational biology, computer science, physics or mathematics. Candidates should have a genuine interest in applying mathematical and computational techniques to achieve biological insights, and experience with computer programming and simulation. Additionally, applicants should have excellent English oral, writing and presentation skills. The candidate is offered a full-time position for 1 year with an extension for a further three years if the evaluation is positive. The gross salary is in the range between 2.266,- (p-scale 0) and maximum 2.897 (P-scale 4) (A according to the Collective Employment Agreement of the Dutch Universities) euro gross per month for a full-time employment. The salary is supplemented with a holiday bonus of 8% and an end-of-year bonus of 8,3% per year. In addition we offer: a pension scheme, a partially paid parental leave, flexible employment conditions. Conditions are based on the Collective Labour Agreement Dutch Universities. The research group will provide the candidate with necessary support on all aspects of the project. If you are interested in doing a computational biology research project on one of the below subjects you are welcome to come and talk about the possibilities in our group. Vroomans, RMA Ten Tusscher KH (2018). Modeling evolution of developmental gene regulatory networks. In Evolutionary Developmental Biology - A Reference Guide Springer. van den Berg, T Ten Tusscher KH (2017). Auxin Information Processing; Partners and Interactions beyond the Usual Suspects. Int J Mol Sci. pii: E2585. Int J Mol Sci..
Laskowski M Ten Tusscher KH (2017). Periodic lateral root priming, what makes it tick. Plant Cell pii: tpc.00638.2016.. Plant Cell. van den Berg T, Korver RA, Testerink CS, Ten Tusscher KH (2016). Modeling halotropism: A key role for root tip architecture and reflux loop remodeling in redistributing auxin. Development , pii: dev.135111. Development. Vroomans RM, Hogeweg P, Ten Tusscher KH. (2016). In silico evo-devo: reconstructing stages in the evolution of animal segmentation. Kazbanov I.V., Tusscher K. Panfilov A.V. (2016). Effects of Heterogeneous Diffuse Fibrosis on Arrhythmia Dynamics and Mechanism. Sci Rep , 20835. ScientificReports. Vroomans R.M.A., Hogeweg P., Ten Tusscher K. (2015). Segment-specific adhesion as a driver for convergent extension. PLoS Computational Biology , e1004092. PLoSCompBiol. Mahonen A.P., Ten Tusscher K., Siligato R., Smetana O., Diaz-Trivino S., Salojarvi J., Wachsman G., Prasad K., Heidstra R., Scheres B. (2014). Van Berkel K., De Boer R.J., Scheres B. & Ten Tusscher K.H. (2013). Development , 140: 2253-2268. Development. DownLoad PDF. Mechanisms and constraints shaping the evolution of body plan segmentation. Eur Phys J E Soft Matter , 36: 54. Eur Phys J E Soft Matter. DownLoad PDF. Ten Tusscher K.H. & Scheres B. (2011). Joining forces: feedback and integration in plant development. Curr Opin Genet Dev , 21: 799-805. Curr Opin Genet Dev. DownLoad PDF. Ten Tusscher K.H. & Hogeweg P. (2011). Evolution of Networks for Body Plan Patterning; Interplay of Modularity, Robustness and Evolvability. Plos Comp Biol , 7: e1002208. Plos Comp Biol. DownLoad PDF. Ten Tusscher K.H. & Hogeweg P. (2009). The role of genome and gene regulatory network canalization in the evolution of multi-trait polymorphisms and sympatric speciation. BMC Evol Biol , 9: 159. BMC Evol Biol. DownLoad PDF. Ten Tusscher K.H.& Mourad A.& Nash M.P.& Clayton R.H.& Bradley C.P.& Paterson D.J.& Hren R.& Hayward M.& Panfilov A.V. & Taggart P. (2009). Organization of ventricular fibrillation in the human heart: experiments and models. Exp Physiol , 94: 553-562. MEDLINE. Keldermann R.H. & Ten Tusscher K.H. & Nash M. P. & Bradley C.P & Paterson D.J & Hren R. & Hayward M. &, Panfilov A.V. & Taggart P.. (2009). A computational study of mother rotor VF in the human ventricles. Am.J.Physiol. , 296: H370-H379. MEDLINE. Ten Tusscher K.H. & Panfilov A.V. (2008). PBMB , 96: 152-170. PBMB. DownLoad PDF. Keldermann R.H. & Ten Tusscher K.H. & Nash M. P. & Hren R. & Taggart P & Panfilov A.V. (2007). Am.J.Physiol. , 294: H764-H474. MEDLINE. DownLoad PDF. Ten Tusscher K.H. & Panfilov A.V. (2007). Europace , 9: vi38-vi45. Europace. DownLoad PDF. Ten Tusscher K.H.& Hren R. & Panfilov A.V. (2007). Circ. Res. , 100: e87-e101. MEDLINE. DownLoad PDF. Ten Tusscher K.H. & Panfilov A.V. (2006). Cell model for efficient simulation of wave propagation in human ventricular tissue under normal and pathological conditions. Phys. Med.Biol., 51: 6141-6156. PMB. DownLoad PDF. Alternans and spiral breakup in a human ventricular tissue model. Am.J.Physiol., 90: 326-345. MEDLINE. DownLoad PDF. Ten Tusscher K.H.& Bernus O.& Hren R. & Panfilov A.V. (2006). Comparison of electrophysiological models for human ventricular cells and tissues. Prog Biophys Mol Biol., 90: 326-345. MEDLINE. DownLoad PDF. Ten Tusscher K.H. & Panfilov A.V. (2005). Wave propagation in excitable media with randomly distributed obstacles. Multiscale Model. Simul., 3: 265-282. DownLoad PDF. Ten Tusscher K.H.& Noble D.& Noble P.J. & Panfilov A.V. (2004). Am.J.Physiol., 286: 1573-1589. MEDLINE. DownLoad PDF. Ten Tusscher K.H. & Panfilov A.V. (2004). Eikonal formulation of the minimal principle for scroll wave filaments. Phys. Rev. Lett, 93: 108106. MEDLINE. DownLoad PDF. Ten Tusscher K.H. & Panfilov A.V. (2003). Influence of nonexcitable cells on spiral breakup in two-dimensional and three-dimensional excitable media. Phys Rev E Stat Nonlin Soft Matter Phys., 68: 062902. MEDLINE. DownLoad PDF. Reentry in heterogeneous cardiac tissue described by the Luo-Rudy ventricular action potential model. Am.J.Physiol., 284: H542-H548. MEDLINE. DownLoad PDF.